HUTCHINSON Builders has commenced construction on a $1.3 million expansion of national child protection organisation Bravehearts’ headquarters on the Gold Coast. The 760sqm build will result in an added 160sqm on the ground floor of the existing premises and an entirely new second floor, all donated by Hutchies and more than 60 building contractors. It will enable Bravehearts to consolidate services under one roof at its Arundel head office and see space double as it strives to achieve a vision to make Australia the safest place in the world to raise a child. Under the new ‘home of child protection’, safety education programs, training, research, royal commission and advocacy and counselling departments will be incorporated with marketing, community engagement, fundraising and management. 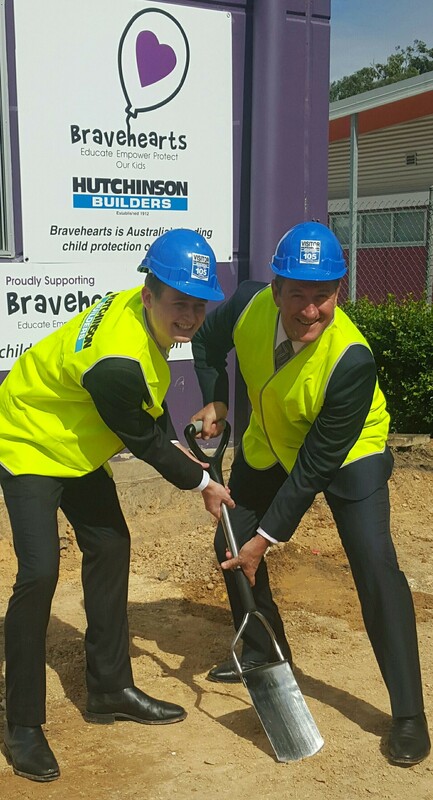 Bravehearts CEO Angelo Venardos (pictured below breaking ground today with Jack Hutchinson), says the unification will bring about improved delivery of support and education services, reaching more children and their families as demand continues to grow. “We are thankful to our corporate partners Hutchies whose incredible generosity will enable Bravehearts to evolve to meet increasing demand on our services,” says Mr Venardos. “This organisation is growing at a rapid rate and the new headquarters signifies a unified and strategic focus on making Australia safer for our kids. Currently we have management services in various locations and this will bring them altogether. “Stopping child sexual assault starts with educating and empowering children with vital knowledge and skills to keep safe and encouraging teachers, carers, parents and other members of the community to play their part in creating child-safe environments. “I am proud to say our child safety education program, Ditto’s Keep Safe Adventure, has now educated more than 600,000 kids Australia-wide, but we still have a long way to go. Hutchies’ Managing Director Greg Quinn was more than happy to jump on board with the expansion when a staff member brought the proposal to him. “Hutchies is well known for its generosity to good causes so when a long-term staff member indicated they had personal reasons for wanting to see child protection services expanded in a proactive and meaningful way, we had no hesitation stepping in to help Bravehearts,” he says. “The support of so many of our subbies and suppliers has been wonderful and we hope our contribution to child safety in Australia as a result of this project produces some real measurable benefits to children in need”.